Putting her best fashion foot forward as usual, the First Lady appeared today hand-in-hand with her husband President Obama for an awards ceremony, sporting a slick geometric print dress. Accessorized with soft waves, shimmering hoop earrings, and the most powerful man in the world, Mrs Obama looked the very picture of summer elegance. The pair were in Washington D.C. in the East Room of the White House, for the President to hand out medals to the 22 winners of the National Medal of Arts and National Humanities awards. 'The arts and humanities aren't just there to be consumed when we have a moment,' the President said. 'We need them.' Winners of the medals included singer Linda Ronstadt, talk show host Diane Rehm, and Dreamworks CEO Jeffrey Katzenberg - one of the President's major donors, according to USA Today. Mrs Obama has certainly been upping her airtime of late. In a video launched today, the Democrats enlisted her to make a passionate appeal to the public, in which she stresses the importance of the upcoming 2014 mid-term elections. 'When it comes to the mid-term elections this November, we need you to be as passionate and as hungry as you were in 2008 and 2012,' she says earnestly, dressed in magenta. And when she's not campaigning for the Democrats or gracing the arm of the President, the First Lady lets loose just like the rest of us. 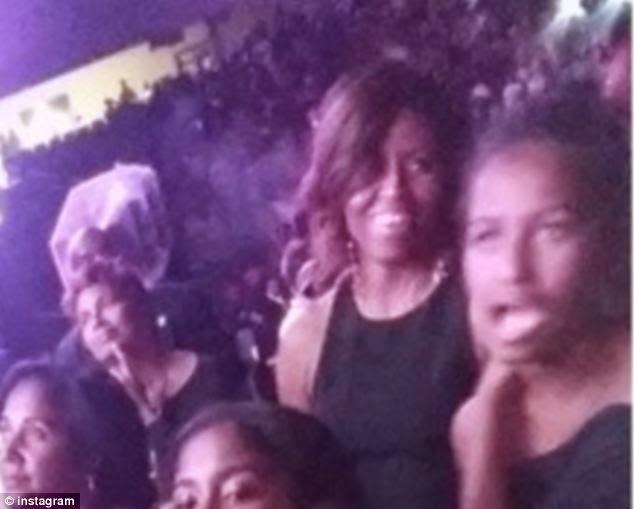 Last Friday, she was snapped in a candid moment with her 13-year-old daughter Sasha enjoying a Beyonce and Jay-Z concert in Chicago.